Having a sick babe is every parent’s worst nightmare and a huge cause of stress and sleeplessness for both parents and babies. However, thanks to developing technology, there’s a newer capability to monitor baby’s health status remotely. Sound like lazy parenting? Think again! With technology breaking new grounds, smart devices are being made that are able to monitor baby’s health like never before, allowing parents to keep a closer eye on their little ones. From oxygen and pulse monitoring to fevers, parents are using this technology to improve safety and health within their homes. We’ve rounded up the top baby health monitors that are keeping babies safe and giving parents greater peace of mind like never before. The Owlet Smart Sock 2 is a total win. One of a parent’s biggest fears is having something happen to their baby during the night when we aren’t able to keep a watchful eye. The Owlet provides peace of mind by monitoring your baby’s pulse and oxygen levels throughout the night and alerting you with any sign of trouble. This type of monitoring is priceless for parents! And although the Owlet Smart Sock 2 may seem expensive, it comes with enough features that justify the high price tag. You’ll get the base station, the smart sock electronics (pulse ox), three sock sizes to fit your little one as they grow, a paper manual, and charging cords. In addition comes a great customer service team, easy troubleshooting website, 45-Day Peace of Mind Guarantee, and a 1-Year Warranty. How’s that for peace of mind? The Owlet MSRP is $299.99, but check the current Owlet Smart Sock 2 – Amazon price. Read the full review for the Owlet Smart Sock 2. It’s hard to find a good adult health, baby health, and pregnancy health tracker, especially a product that contains all three features. With the Project Nursery Parent & Baby Smartband you will get a parent health tracker, baby health tracker, pregnancy tracker, reminders, a digital watch, and more all in one sleek little smartband. It can be worn by both parents and syncs automatically by Bluetooth to your smartphone. 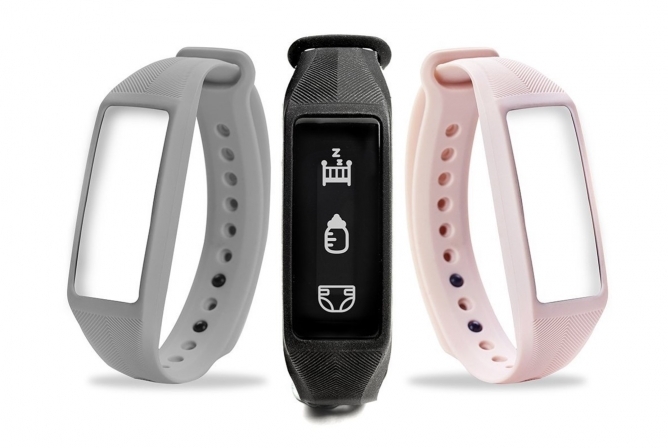 With the many features and uses that come with the Project Nursery Parent & Baby Smartband, any parent will get their money’s worth out of this product. It is made to be used from day one and beyond to help us keep up with the demands that are required of being a parent in this busy era.The MSRP is $99.99, but click here to find the current Project Nursery Parent & Baby Smartband – Amazon price. Read the full review for the Project Nursery Parent & Baby Smartband. 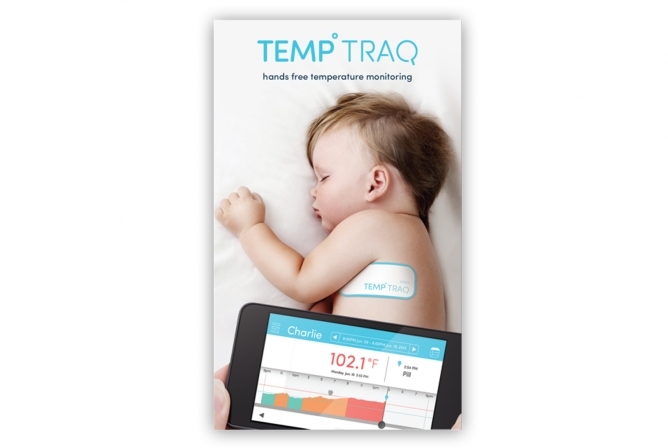 The TempTraq thermometer uses low emission Bluetooth technology to send data from your baby over to the app on your smartphone or smart device allowing you to monitor baby’s temperature remotely. It’s very easy to use (minus occasional connectivity problems) and can be very versatile. TempTraq is very soft, thin, and flexible, ensuring comfort for your baby. The app has a very easy interface and includes some very useful features. While using TempTraq, it is possible to monitor more than one child (or adult) at once, especially useful if an illness is running through your house. Another useful feature in the TempTraq app is the ability to take notes at any time of the day in a free text box, giving you the freedom to add any notes that are needed, from symptoms to medication times. Baby’s temperatures are also recorded in graph form and can be saved for sending to your doctor or to other family members. All-in-all, TempTraq is a nice Bluetooth thermometer if you are looking for a single use unit and price isn’t an issue. MSRP for the TempTraq is $24.99 but check out the TempTraq – Amazon price right now. Read the full review for the TempTraq. In the end, POMO Bebe is a high-end baby activity tracker that has many fun features. 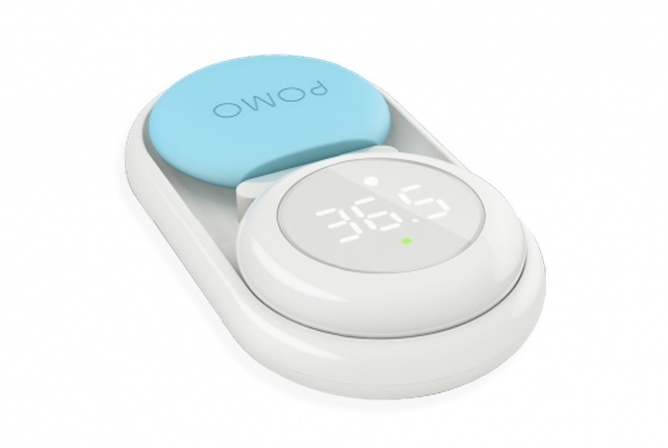 Although the price for POMO Bebe might seem high at first, if you were to buy a thermometer (for baby and for milk), an activity tracker, a nighttime movement tracker, and a room thermometer, you’ll find the price will add up quick. With all that is included, the price for the POMO is quite a deal. Because this is a newer device, and one of the first of its kind, there really isn’t a lot of information on how well the POMO performs yet, but expect updates from BabyGearSpot! The POMO Bebe (as well as other activity trackers my POMO!) is a useful and versatile smart device that helps make parenting just a little easier, providing increased safety for baby and greater peace of mind for parents. The MSRP is $119 but check the POMO Bebe – Amazon price here. Read the full review for the POMO Bebe. You can really tell that the Infanttech Smarttemp was designed by parents due to all the thoughtful and useful features included. It can read your baby’s temperature continuously by sticking it under their arm during the night with an adhesive patch. The information is relayed directly to your phone or tablet by low emission Bluetooth so that you don’t have to worry about exposing baby to EMF radiation. It’s also waterproof and easy to clean, making it versatile and durable. Because it’s waterproof, it can also be used to monitor bath water temps or milk temperature. And use doesn’t stop with babies! This little Smarttemp can be used on older children and adults to monitor temperatures on hot (or cold) days too! It’s FDA approved and can help prevent possible health complications that might result from high (or low) temperatures by alerting parents when little one’s temperature is abnormal. The Infanttech Smarttemp is a high-tech little thermometer that will give you wonderful peace of mind while also keeping your baby safe! With an MSRP of $69.99, check the Infanttech Smarttemp – Amazon price here. Read the full review for the Infanttech Smarttemp. Although baby smart monitors are a newer item on the market, they have the potential to seriously increase safety and peace of mind for baby and parents. Not only do they make certain aspects of parenting easier, but baby health monitors can help parents catch certain health problems and illnesses earlier than if they weren’t being used. These devices, however, should be used with caution and should never replace parental supervision or monitoring. That being said, these devices are some of the first of their kind and are paving a new road for many more safe and useful items in the future!